Convert Your Air Suspension To A Passive Coil Spring Suspension. End Your Air Suspension Problems Forever! Strutmasters 2000-2005 Audi Allroad Quattro 4 Wheel Air Suspension To Coil Spring Conversion Kit is the perfect solution to your air suspension problems. Designed to be very affordable, you can convert your ENTIRE air suspension system to use passive (non-electronic) struts and coil springs for LESS than the price of replacing just ONE Original Equipment air strut. Includes Instructions To Disable The Suspension Warning Light. 2000-2005 Audi (C5) Allroad Quattro 4 Wheel Air Suspension Conversion Kit (AB14F) is the perfect solution to your air suspension problems. Designed to be very affordable, you can convert your air suspension to use standard. The Audi air suspension system was a marvel of technology when it was brand new. But before you decide to begin replacing air system components, know that many of our experienced shops tell us a complete overhaul of the system is needed to guarantee a successful repair. Want to keep it original? Be prepared to open your wallet! When one part goes bad, several others are right behind it. The system relies on a computer, known as the suspension control module, to function properly. An Original Equipment control module from the dealer for this vehicle retails for $975. The system also relies on ride height sensors at each wheel ($240 x 4). An onboard air compressor ($1430) and struts with an air spring at each corner of the vehicle (as much as $5500 for the four of them) are other key components. Add it up and you'll see why the Strutmasters suspension conversion kit at $699 is the most popular repair option on the market today. 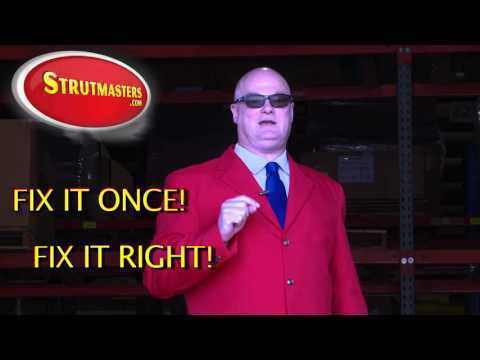 Instead of spending $5000 or more on a system that is destined to fail again, you can solve the problem permanently with Strutmasters for only $699. The conversion kit gets rid of the need for complicated electrical parts and air suspension components that won't last. The Strutmasters conversion kit includes: two pre-assembled complete front struts with premium Eibach springs and two pre-assembled complete rear struts with premium Eibach springs. The kit is designed to bolt right in place of the factory air struts and can be installed in as little as an hour per wheel. Each Strutmasters conversion kit is designed, assembled, sold, shipped and serviced from their family-owned facility in North Carolina. It comes with detailed instructions, including a way to disarm the suspension warning light. Another Strutmasters advantage is access to phone tech support from experienced staff. Why gamble thousands messing around with a worn out air suspension system? Choose a Strutmasters conversion kit for $699 and have Peace of Mind that your vehicle's suspension will never drop down again! How Do I know If My C5 Allroad Quattro Air Suspension is failing? A sudden loss of three to five inches of ride height means the air suspension on your 2000-2005 Audi C5 Allroad Quattro is in trouble. The entire vehicle may be sitting low, or it can drop in the front, rear or either side. This loss of ride height normally occurs when the vehicle's onboard air compressor can no longer make enough air to keep the system fully pumped up. The number one cause of leaks in the system are tiny cracks in the rubber air spring portion of the vehicle's air struts located at each wheel. Wear from millions of up and down motions and dry rot due to aging cause the cracks to appear in the rubber. Air starts to leak slowly at first, then as the leaks grow worse, the onboard air compressor works more and more until it eventually gets overheated and quits. Although some compressors may fire back up after time to cool off, they won't be able to make enough air pressure to do the job. An Original Equipment air compressor can cost as much as $1430 at the dealer; and the air struts needed at each wheel of the vehicle can cost over $1300 apiece! Replacing all of these components at the tune of $5000 still leaves the suspension control module ($975) and ride height sensors ($240 times four) to worry about. When the system starts to malfunction, it is normal for an illuminated suspension warning light or message to appear in the instrument cluster. An extremely noisy air compressor or one that runs constantly can be earlier signs of trouble with the system. Experienced technicians say that a complete overhaul of the system by replacing each of the major components mentioned earlier, is the only way to ensure a successful repair. 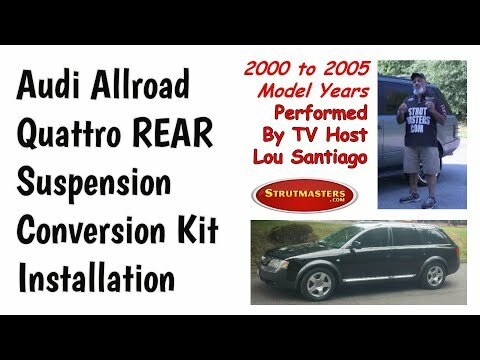 Since spending $5000 or more on an older, higher mileage vehicle doesn't make sense for many Audi owners, Strutmasters invented the suspension conversion kit as an alternative to solve the problem for only $699. = TOTAL: Over $5,552 (and that doesn't even include replacing electronic components that are known to fail such as the height sensors). 2000-2005 Audi (C5) Allroad Quattro Air Struts (x4)- Metal tubes filled with a gas-charged hydraulic fluid that controls bouncing motions and dampens vibration caused by travel on rough road surfaces. On this vehicle, the struts are the mounting place for an air springs that fills with compressed air and helps support the weight of the vehicle. These air springs, which take the place of a traditional steel coil spring, are managed by the suspension control module. The air springs are made of plastic and rubber and eventually develop cracks in the rubber and leak air from the system. The entire air strut unit can cost as much as $1458 each for Original Equipment units at the Audi dealer. 2000-2005 Audi (C5) Allroad Quattro Air Lines- Tubes that carry pressurized air from the air compressor to the rubber air springs. 2000-2005 Audi (C5) Allroad Quattro Solenoids (x4)- Plastic and metal components that regulate the air pressure for each air spring. Solenoids start to leak as they wear out, causing the compressor to run excessively. Leaking solenoids contribute to failure of the compressor. 2000-2005 Audi (C5) Allroad Quattro Air Compressor- Creates and sends pressurized air to each of the vehicle's four air struts. When the air suspension starts leaking, the compressor (also known as an air pump) starts working harder to try to keep the system inflated. By the time air suspension leaks down completely, the compressor has completely failed or will no longer make enough air to keep the system inflated. An Original Equipment compressor can cost as much as $1430 at the Audi dealer. It is recommended to at the very least replace all four air struts at the same time as replacing the compressor. 2000-2005 Audi (C5) Allroad Quattro Dryer Assembly- Used to keep moisture out of air lines and air springs in order to prevent freezing and internal cracking of these parts. Once air suspension starts leaking, moisture will build-up throughout the air system. Moisture damages the air suspension from the inside. The dryer will need to be replaced in order to eliminate the moisture and prevent any further damage. 2000-2005 Audi (C5) Allroad Quattro Suspension Control Module- A computer responsible for the operations of the air suspension system and maintaining the vehicle's correct ride height. Replacement of this module at the dealer can cost as much as $975. 2000-2005 Audi (C5) Allroad Quattro Rubber O-rings- Although they are the least expensive parts of the air suspension, they are responsible for maintaining the seal where all of the air lines connect. Be sure to replace the O-rings when repairing any air suspension system.